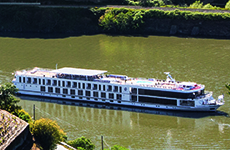 Named after the beloved 13th century Portuguese queen, Queen Isabel, offers a 118-passenger capacity, which allows for 18 junior suites and two larger suites with full balconies. Comfortably appointed suites include modern conveniences such as flat-screen TVs and luxurious L'Occitane bath and beauty products. Public areas include a lounge with full-size bar, a restaurant with an al fresco dining area, and a sun deck with heated swimming pool.